Lloyd holds degrees in Mathematics (MA) and Old Testament Studies (BD Hons) and an honorary DD from Otago University, NZ. He was ordained and worked as a Presbyterian minister, going on to Chairs of Old Testament Studies in Brisbane and Dunedin before being appointed as foundation Professor of Religious Studies at Victoria University of Wellington. Since retiring in 1984 he has lectured throughout New Zealand and overseas. His publications include Tomorrow’s God (1996), Christianity Without God (2002), Wrestling with God—The Story of my Life (2006) and Coming back to Earth (2009). 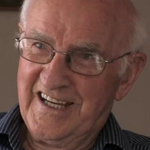 Charged by the Presbyterian Church with heresy in 1968, Lloyd Geering remains among the most controversial theologians in New Zealand. He is still deeply involved in debating ideas about religion and life. The 2008 TV series “The Last Western Heretic” explores his world view. He became a Knight Grand Companion of the Order of New Zealand in 2009.